The term is often used interchangeably with terms like ‘wear and tear’, ‘arthritis of the spine’ and ‘degeneration of the spine’. Spondylosis occurs when the soft tissues (which includes muscles, the intervertebral discs, ligaments and cartilage that lines facet joints) naturally deteriorate over time. The two most common sites for Spondylosis are the neck (Cervical Spine) and the lower back (Lumbar Spine). It is relatively uncommon in the thoracic spine because this is connected to and supported by the ribcage. — Spondylosis is common in this area, mainly because the vertebrae support the weight of the head and are very mobile. — Spondylosis is prevalent in this region because the lumbar vertebrae supports the majority of the body’s weight. Pain or aching over the affected area. Numbness, tingling or loss of sensation in arms or legs due to nerve irritation. Exercise – Low impact exercise that help to maintain your movement, like swimming or Pilates. Specific exercises aimed at maintaining your range of motion (ROM) in the spine. Avoid – High impact exercise (like running) and challenging activities like painting ceilings. 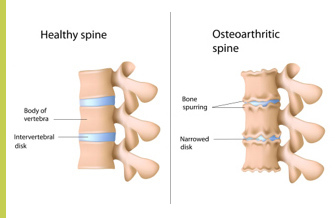 How Can Osteopathy help with your Spondylosis? If Osteopathy is considered suitable then it can be highly effective in helping Spondylosis, both for an acute episodes as well as long term management to help avoid further episodes. Our treatment is geared towards relieving the pressure on the nerves, muscles and joints, through a gentle combination of soft tissue massage, stretching techniques and joint mobilization. Click here to read a case study about a patient who came to the clinic with Spondylosis.